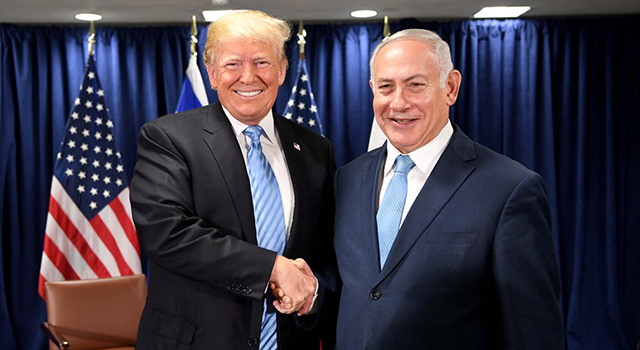 (JTA) – While America’s global image has “plummeted” during Donald Trump’s presidency, Israelis give high marks to his administration and the country as a whole, according to the Pew Research Center. Israelis were often three times more likely to give Trump a positive rating than those surveyed in other allied countries, including Mexico, Germany, Canada and France, according to a Pew poll released Oct. 1. Eight out of 10 Israelis express a favorable opinion of the United States and more than half believe that America is doing more to address global problems than a few years ago. In Israel, Trump’s “positive rating jumped to 69 percent, up from 56 percent in 2017” on the heels of his decision to move the U.S. Embassy, according to the report. By contrast, while 93 percent of Spaniards said they had no confidence in Trump, followed by 91 percent of Mexicans and 90 percent of Frenchmen, only 31 percent of Israelis expressed this sentiment.